No, that’s not gefilte fish. And that’s exactly what I love about it. Let me introduce you to my version of Polpettone di Tonno, Italian tuna loaf. 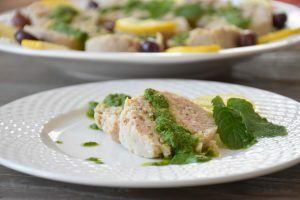 It plays the “gefilte fish” role of festive holiday fish appetizer, but with more nuanced and fresher flavor. 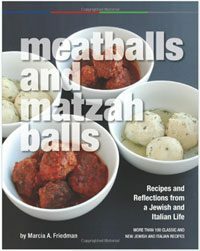 I shared the recipe and wrote the accompanying article, “Giving Gefilte Fish (and Guilt) the Boot,” for Jewish Food Experience, and was honored to have my Polpettone di Tonno featured as one of JFE’s Top 10 Recipes for Rosh Hashanah 2017. Please visit JFE to see the article and recipe together, and be sure to check out the whole list of other great recipes that will work for your table any time of year! Canned tuna (ideally an “Italian-style tonno”) works perfectly. I prefer the loaf to have a little texture rather than be a more homogeneous mass, so I chop the tuna and artichokes by hand. You do still need to get the chunks small though, as bigger pieces in the loaf will make more fragile and crumbly. If you prefer it to be smooth or don’t feel like chopping, feel free to use your food processor, of course. 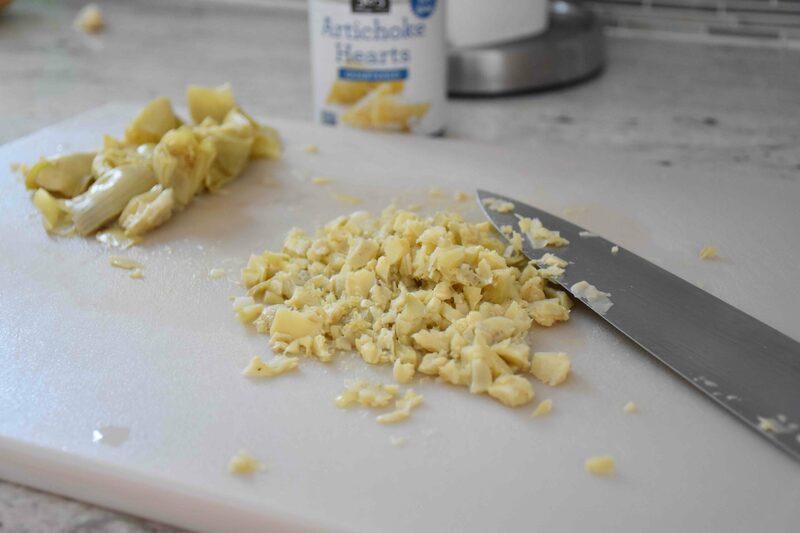 Use only the tender part of the artichoke hearts. Tough leaves will not blend in well with the loaf. Reserve the rest of the artichokes for salads, pizzas, and pastas. 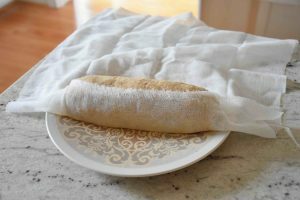 Once you shape the mixture into a tight loaf, start rolling at one end of the cheesecloth to make sure your create a snug wrap. This will help ensure the loaf cooks up intact and stays together when you unwrap it later. Use a little kitchen twine to tightly tie off the ends. Then just be sure to support the loaf from the bottom (using two large spatulas works well) when you lower and lift it. The goal is to avoid breaking it or creating weak spots. This Italian-inspired recipe offers a fresh flavorful alternative to traditional gefilte fish for holiday meals. I’ve boosted the flavor and texture with the addition of artichokes and a topping of salsa verde—green sauce, which I’ve enhanced with horseradish in a nod to gefilte-fish tradition. The Parmesan cheese can be omitted if you need a nondairy dish. The dish is gluten-free and Passover-friendly. Note that you will need cheesecloth and twine. Be sure to wrap the loaf tightly so it retains its form after cooking. Since it is not ideal to puncture the loaf with a thermometer to determine whether it has reached the government-recommended safe temperature (160 degrees) for dishes containing raw eggs, I recommend using pasteurized eggs for this dish. Finely chop the tuna by hand or with a food processor and thoroughly combine it in a bowl with the mashed potato, artichoke hearts, Parmesan (if using), pepper, and eggs, breaking up any remaining large chunks. The mixture should be cohesive. Place the cheesecloth on a plate or other surface. 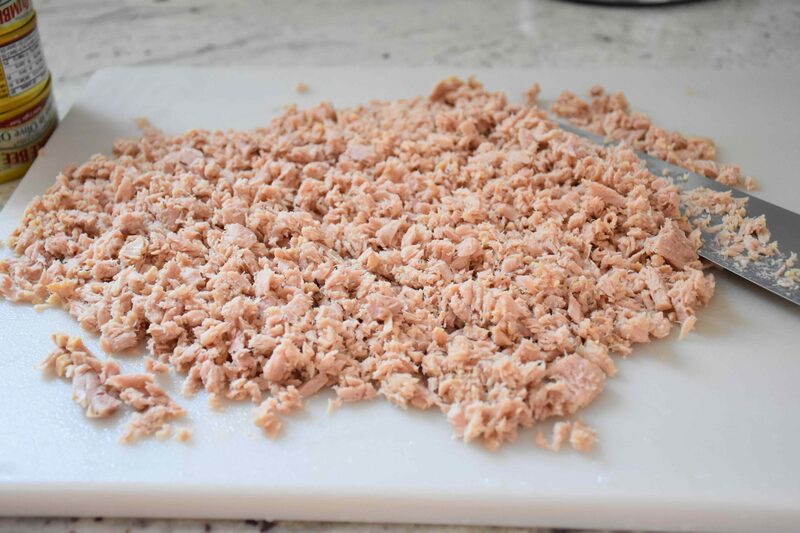 Spoon on the mixture near one edge of the cloth and shape the tuna into a roll about 2½ inches in diameter and 9 inches long (make sure it will fit into your cooking pan). Squeeze the roll tightly to ensure the mixture is compact and evenly distributed. 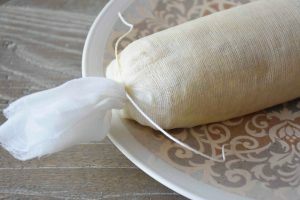 Roll the cheesecloth very tightly around it, and twist the ends and tie them with kitchen string. In a wide, deep pan, heat a layer of olive oil over medium heat. Add the garlic and cook, stirring constantly, until garlic is fragrant and starts to brown, 1 to 2 minutes. Stir in the onions and salt, and cook, stirring, 1 to 2 more minutes. Carefully place the tuna roll on top of the onions. Slowly pour the white wine over the top of the roll (don’t pour it directly into the hot oil), then slowly add water to just cover the roll. Bring to a gentle simmer and cook uncovered, gently turning the roll a few times, 40 minutes. Using two large spoons or spatulas to support the ends, carefully transfer the tuna roll to a dish. As soon as it is cool enough to handle, gently remove the cheesecloth. If the roll cracks or separates, firmly reshape it. Cover the dish tightly with foil and refrigerate overnight. Before serving, make the salsa verde by placing all the sauce ingredients except for the olive oil in a blender. Add about ¼ cup of the oil and pulse, processing and adding additional oil until smooth enough to pour. Cover and refrigerate until serving time. To serve, let the tuna roll and sauce sit at room temperature for 10 to 15 minutes. Use a serrated knife to gently slice the roll into ½- to ¾-inch pieces. Arrange slices on a platter or individual serving plates. Cut the lemon in half and squeeze juice over slices. If the sauce is too thick, thin with warm water. Spoon salsa verde over the slices, and, if desired for garnish, add slices from remaining lemon half as well as whole black olives. Note: To quickly prepare the mashed potato, peel and cut 1 large russet potato into approximate 1-inch pieces. Place in microwave safe bowl, cover with water and add 1 teaspoon kosher salt. Cover and microwave on high 6 to 9 minutes, checking every couple of minutes after the first 3 minutes, until potatoes are tender. Drain well and mash or press though a ricer.